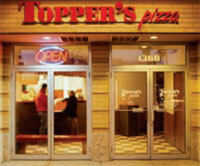 Toppers Pizza franchise business opportunity. Free Toppers Pizza business franchise information. Before Topper's Pizza, there were basically two kinds of pizza businesses. The first kind are the fast food pizza delivery companies focused on simple menus and quick service. The biggest pizza companies in the world fit into this category. The second kinds are those companies providing a higher end pizza menu. Typically those are sit-down restaurants that either don't deliver, or offer delivery in an hour or more with a hefty delivery charge added. Our menu is superior because we use fresh, hand-prepared ingredients. We cut our own vegetables and sell only the highest quality meats and real <?xml:namespace prefix = st1 ns = "urn:schemas-microsoft-com:office:smarttags" />Wisconsin cheeses. We prepare our dough and sauce fresh, from scratch, in each store's kitchen. What is the average size of a Topper’s Pizza location? The average size is between 1,300 and 1,600 square feet. What are the average annual sales of a Topper’s Pizza? An average of 53 weeks sales ended January 2, 2005 at six Midwest Topper’s Pizza stores was $900,049 as disclosed in our UFOC Item 19 Earnings Claim. Most franchisees are willing to discuss more detailed financial performance information with you once it is determined that you are serious about investing in a Topper’s Pizza Franchise. How long does it take to open a Topper’s Pizza store? On average it will take 6 - 9 months from the time you sign the franchise contract to the time you turn on your OPEN sign. Currently we are looking for franchisees in nine states: WI, IL, MN, IN, MI, IA, NE, MO, OH, ND, SD, KS, NC, SC & GA and KY.
To learn more about the Toppers Pizza franchise opportunity, simply complete the form below.